In this article, I want to focus on the three keys to wine appreciation – techniques that are, in my opinion, critical to making every wine experience a great experience. I passionately believe in making the most of my senses – food and drink, music, walking – whatever it is. And I passionately believe in learning whenever I can, as a way of ‘seizing the day’. Combining sensory experiences and learning experiences through wine tasting can make for a great experience. It can also improve your wine wisdom. In other words, the more you taste using these techniques, the better your next wine tasting experience will be, and so on. Before I started studying winemaking, I knew very little about what tastes or smells I should be picking up in a particular wine. When I did pick up something, most of the time I wasn’t sure what to call it (“It smells a bit like wine….?”). Also, I wasn’t really confident about the contributing factors from the wine. What caused my mouth to feel ‘dried out’ after tasting a Cabernet Sauvignon? (it turns out it was the tannins) What effect did the age of the wine have? As part of the University course, we attended weekly wine tasting classes on Friday mornings (I know, a tough job, but someone had to do it). We compared wines against each other, we did blind tastings (where you don’t know exactly what you’re tasting) and we talked about what we thought about each one. The combination of tasting the wines comparatively (that is, comparing one against the other), hearing what other people thought about them and then learning about what influenced their characteristics (climatic influence, bottle age, region, variety, etc) that brought it all together. I had been attending the tastings for several weeks when suddenly I had an ‘A-Ha!’ moment. Suddenly I was able to connect the dots – to make basic sense of what most wines were about. I suddenly was confident to shop for wines, knowing mostly what I was looking at. Suddenly I could look at, smell and taste a wine, having some idea what I was sensing. Suddenly I could discuss these things with some confidence. It is this process of learning about wine that drives me to help you get the most from your wine experiences. I started Wine Wisdom Made Easy because I passionately believe that the best (and most fun) way to learn about wine is to combine these three approaches. asking a friend what they think of a wine (What are they smelling? What are they tasting? What about texture?) – it is the perspective of other people that really helps us contextualise our own sensory experiences. Here at Wine Wisdom Made Easy I’m working on bringing you easy and fun ways to ‘bring it all together’. Ways to accelerate your wine learning through tasting. Ways to make the most of your wine purchases. Ways to have a whole lot of fun at the same time. 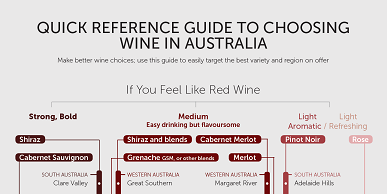 Get started by downloading the wine buying guide, below.